Michigan Auto Transport works pretty well in the Spring, Summer and Fall, but Winter can be a real problem for much of Michigan. There’s plenty of action from Michigan to Florida in the Winter, especially from Detroit, but the harsher winter conditions farther north make it problematic for the car shipping carrier’s hydraulics. The slippery road conditions raise the possibility of road accidents and insurance claims. So the Winter in far northern Michigan is for some almost hands off. Michigan is a sportsmen’s dream. So beautiful. The name has its root in the Indian Chippewa word “mishigamaa”, which means big lake. Makes sense, right? The French fur traders came along in the 17th Century, liked the name but changed it ever so to the French form “Michigan”, which stuck. See there, you learned something here besides how to ship your car. The French and local Indian tribes got along fairly well, and developed for the most part a mutually beneficial coexistence. Everything was just great until the British won the French and Indian War in 1762, however, and took over Michigan. The British maintained control for only about fifty years, as the American Revolution in 1776 and later War of 1812 shifted control over to the Americans. Nobody cried over that as most of the inhabitants in Michigan were of French and Indian descent. 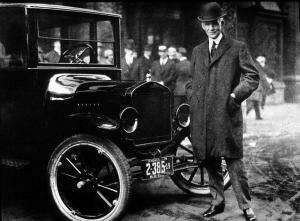 The advent of the automobile and the brilliance of Henry Ford, who figured out how to mass produce cars and better still make them more affordable to his own employees, was what thrust Detroit into the forefront of the American economy in the 20th Century. President Dwight Eisenhower’s Secretary of Defense once said, “what was good for the country was good for General Motors and vice versa.” That may still hold true. Though we tend to think that any city that produces talent like Bob Seger, Diana Ross and Motown, is what makes Detroit most valuable. Regardless, Detroit rocks and we love shipping cars there! There are a number of main interstates that vehicle shippers use to service Michigan. I-75 runs from Florida through Ohio, north all the way to Michigan, intersecting Detroit and then straight to the U.P., where it finally ends at the Canadian border. I-69 enters from Indiana and heads north through Lansing and Flint, and then breaks the rules for an odd numbered interstate by heading due east toward Canada. We’ll let ’em slide on that one. I-94 and I-96 relieve a lot of traffic pressure on I-75 in greater Detroit. So Michigan auto transport is a breeze from the standpoint of freeway access. 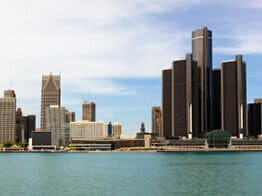 If you are headed to the Detroit area or to any other, our Michigan auto transport can really help. If you have questions about car shipping, feel free to contact us by dialing our toll free number at 800-600-3750. You can also visit Direct Express Auto Transport to fill out a simple form and get a free car shipping quote. We make it easy to book your vehicle shipment online.